Leguminous plants are those that belong to the the Fabaceae or Leguminosae family of plants. 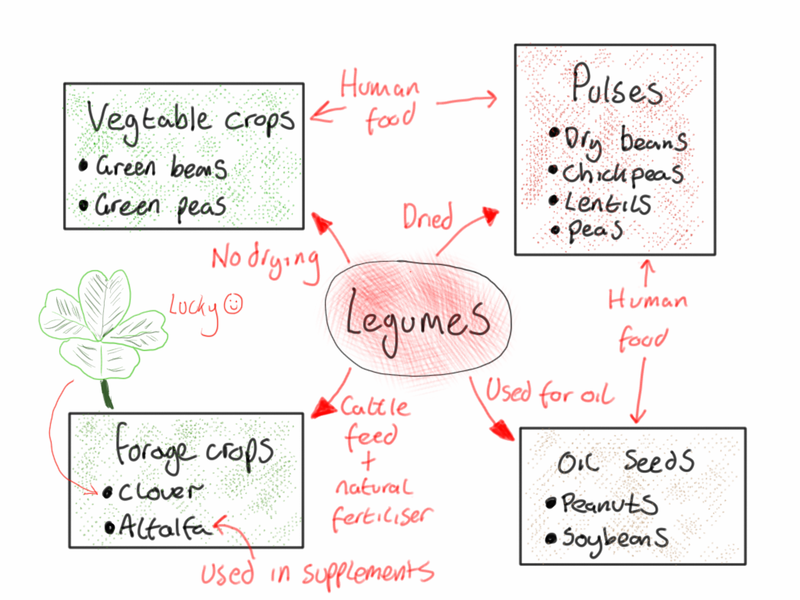 Leguminous plants produce a number of crops that are important in human and animals nutrition including beans, peas, peanuts, soybeans and alfalfa. Legumes have agricultural significance because they possess root nodules that contain symbiotic bacteria called rhizobia that can fix nitrogen. This makes them an important part of the nitrogen cycle and important in crop rotation. Legume terminology can be confusing because the Fabaceae family produces a heterogenous group of edible structures. The pods and fruits of leguminous plants are referred to as legumes if eaten whole, and this can include green beans and green peas. The seeds within the pods are legumes also, but are also referred to as grains or grain legumes if they are dried. As peanuts and soybeans are not dried but used for their oil, they are legumes, but not pulses. Alfalfa is a leguminous plant that is is grown to feed for cattle and when eaten is therefore referred to as a forage crop. The definitions of the edible leguminous plants are given in figure 1. Figure 1. The leguminous plants produce a heterogeneous group of edible structures with differing terminology.